Calling all Android users, today’s a great chance to stock up on some high-quality USB-C cables for your phone or tablet. We said it before and we’ll say it again, the future’s USB-C and it’s a good idea to grab the necessary cables right now if you are willing to embrace the wonderful technology. Luckily, ANKER has a knack for putting deals up on an almost-regular basis. 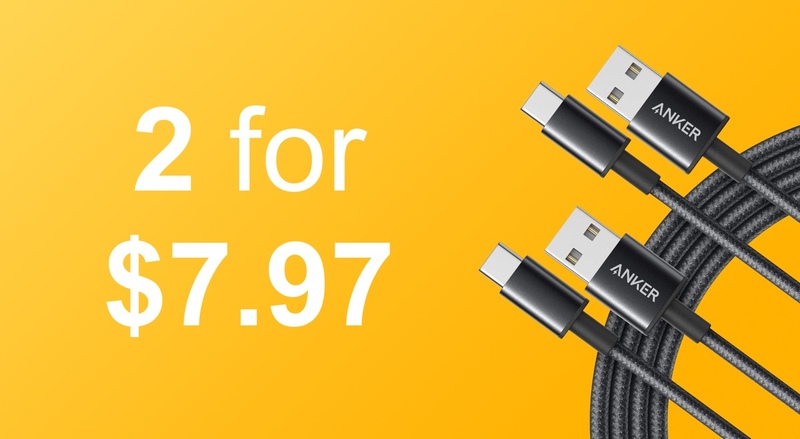 Today the company has put up its USB-C cable for sale, bringing the price down to just $7.97 from its usual $10 mark. But what’s great about this deal is that it applies on a 2-pack of cables. So for under 8 bucks you’re getting twice the cable. Apart from having a USB-C connector that goes into your smartphone or tablet, the other end of the cable is USB-A meaning that it will fit straight into your existing (old) charger. In fact, this cable is perfect for traveling as well, given that you are not ready to invest in new USB-C chargers just yet, therefore it will fit right in. The cable is nylon braided, therefore it will not break when twisted, tangled or tugged on. If that doesn’t impress you then the fact that this cable is 6-feet in length will. That’s a lot of cable we’re talking about. This cable is so long that you can charge devices on the back seat of your car, given you’re ready to sit on the edge a little. Interested in this deal? Head over to the link below. And remember, don’t forget to clip the on-page coupon in order to bring the price down to $7.97.